The Only Good Varmints is DEAD Varmints! Always on the lookout for quick and easy bug elimination that's fun, too, I am very impressed by the Moskitofanger designed by Johannes Vogl. Designed to "off" more flight-prone vermin, the device both kills AND cremates a bug at the squeeze of a bicycle brake. Though, in my younger days, I must admit I've experimented with the rudimentary design, I really liked the "safety" features involved in this contraption--namely, the fact that the user is at least several inches from the flame. 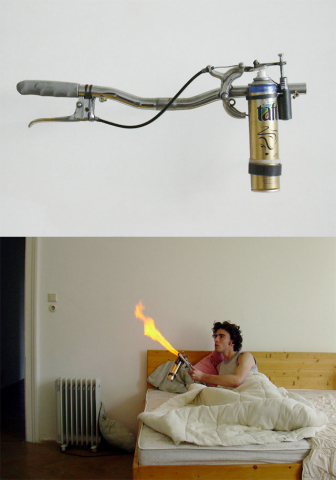 A lighter is controlled "remotely" via a bicycle handlebar. A brake lever attachment allows you to ignite the spray from a can of hairspray, which will keep blasting flame until you let it go. Granted, this probably isn't the best gadget for the 12-year-old fascinated with arson, but it could be a useful tool for lighting illegal fireworks (not that I'm advocating that practice..) or, perhaps, roasting weenies (though they would taste like Aquanet). When the icky bugs meet their maker (usually the same time they meet Chewie in my house), I do not mourn their deaths, but celebrate the fact that they're no longer on my plane of existence. I present to you the Dead Bug Funeral Kit by David Barringer which contains everything you need to properly deliver a dead insect to the great bug beyond. It contains a 32-page illustrated Buggy Book of Eulogies with ribbon bookmark, casket, grave marker, white clay flower,burial scroll with instructions and a pouch of grass seed all packed in Spanish moss inside a tin box. Though my intense fear would make it very difficult for me to get near and collect the insect remains to place in the tiny coffin, it could be a fitting, meaningful sendoff for that special bug. I like to think of it as a celebration of death! USBs and Phones and Bears -Oh My! Skolkovo, A New Silicon Valley In The (ex)-Soviet Union?